Armed with Tweets and Facebook updates, activists are making their mark from Milwaukee to the Middle East. Social media is playing a powerful role. And we all need to get better at managing and using these tools. 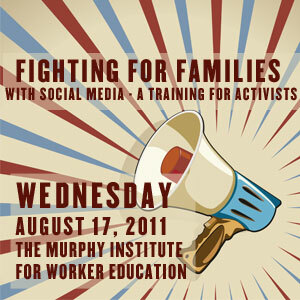 Our Fighting for Families social media training will focus on both sides of the fence: the organizations and organizers that lead campaigns, and the individuals able to move it forward from their computers and cell phones. Social media in particular is an important component of a story telling strategy. With a dedicated team of citizen activists, we can make a real contribution to the ongoing fights for paid sick days, paid family leave and other struggles for our families’ future. This training will be held on Wednesday, August 17 at the CUNY Murphy Institute for Worker Education in Manhattan. Register at http://socialmediatrainingnyc.eventbrite.com.